Please note that both iOS and Android versions can share the same database on back4app. If you want to test it on the Android Emulator on Android Studio, just drag & drop this apk into the Emulator and it will automatically install the app for test. Hey! 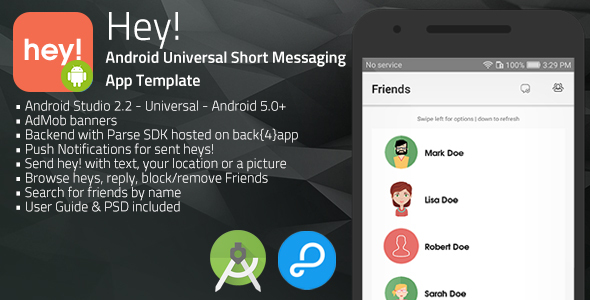 is a Universal App Template where you can send short messages like hey! to all those friends who are registered in the app with just a tap. It’s that simple, the simplest communication app ever. attach a picture to it or your current location, or simple text of the selected hey!. They will receive a Push Notification and can easily reply to your “hey!” by sending it back. Users are able to block/unblock other users, remove the from their list and make group of friends to send heys! all in once, again, with just a tap! Push Notifications for sent heys! Have fun with Hey!, and don’t forget to rate it on your Downloads page! We’ve recently found out that some developers have bought our app templates, reskinned them just a bit and put them on sale on other source code markets similar to CodeCanyon, saying that they developed and own such source codes. That is a serious copyright infringement, developers who buy our templates are allowed to reskin and sell them as apps on the App Store (accordingly to the License type they’ve purchased a template for), but are not allowed to put our original source codes for sale on source code markets, including CodeCanyon. We will report developers who made copyright infringements to the competent authorities.